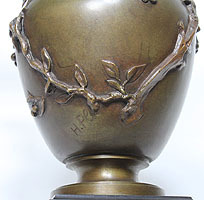 Henri-Honoré Plé (French, 1853-1922) A Fine and Charming Patinated Bronze Group of a Two Young Boys Climbing on a Vase with Cherry Blossoms Vines. 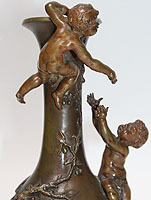 The finely executed bronze group depicting two semi- naked infant boys climbing atop a bottle-shaped vase intertwined with cherry blossom vines, passing the picked cherries from one to another, raised on a square black marble slate base. Signed at the base: H. Plé. Circa: Paris, 1900. Henri-Honoré Plé (1853-1922) was a French Sculptor born in Paris on March 8, 1853 and died in Paris on January 31, 1922. A student of Gérault and Mathurin Moreau (French, 1822-1912). He exbited at the Salon in 1877. He became a member of the Sociétaire de Artistes Français after 1887. He received an honorable recognition in 1879 and a third place medal for his class in 1880 and another honorable recognition at L' Exposition Universalle of 1889 and a bronze medal at L' Exposition Universalle of 1900. E. Benezit Dictionaire des Peintres, Sculpteurs, Dessinateurs et Graveurs by Gründ - Nouvelle Edition, 1976 - Volume 8, Page 380.